Before opening a claim for unemployment benefits in Illinois, there are several conditions you need to meet to be eligible. IDES determines if benefits are available to an individual and this varies from case to case. Each claim for benefits is based on that individual's personal and previous work information. The Illinois Department of Employment Security office suggests that filing an application for unemployment is the most accurate way to determine if you are eligible for any benefits. In Illinois, there are a number of prequalifying conditions you must meet. These conditions fall under a group of work-based criteria or wage-based criteria. The reason for loss of employment cannot be of your own volition, meaning you cannot quit your job for personal reasons--your employment cannot be terminated because of negative disobediences, conscious disregard for your employer, or violating reasonable standards of behavior in the workplace. In Illinois, any employee fired for committing a felony or theft will not be eligible for collecting benefits. Your previous wages must meet a certain amount. In Illinois, you are required to have made enough wages during the past 18 months for IDES to provide a Weekly Benefit Amount. Termination of your job should be considered a no fault situation, such as leaving to be with a spouse in the military or leaving to take another job, but that job falls through. You must be proactively seeking employment and be available and capable of working any legitimate job offer. Before successfully claiming unemployment benefits in Illinois, there are a number of prequalifying conditions you must meet. These conditions fall under work and wage-based criteria and are just part of meeting minimum work search requirements. If you were employed in Illinois during the last 18-months, you are eligible to file an insurance claim. In order to be eligible by law, you must have earnings of no less than $1,600 in your base period for insured employment. These wages could either be earned in your base period or in an alternate base period. You must have earned at least $440 of that $1,600 outside of your highest paid calendar quarter. Basic Base Period: The Illinois base period of employment is the first four out of the last five quarters completed before a claim is considered effective. Alternate Base Period: This is for claimants who do not meet the minimum requirement for wages earned during their base period. It consists of the last four calendar quarters completed before a claim is considered effective. This takes into account any recent employment. Some claimants use their alternate base period if it results in a weekly amount that is higher. 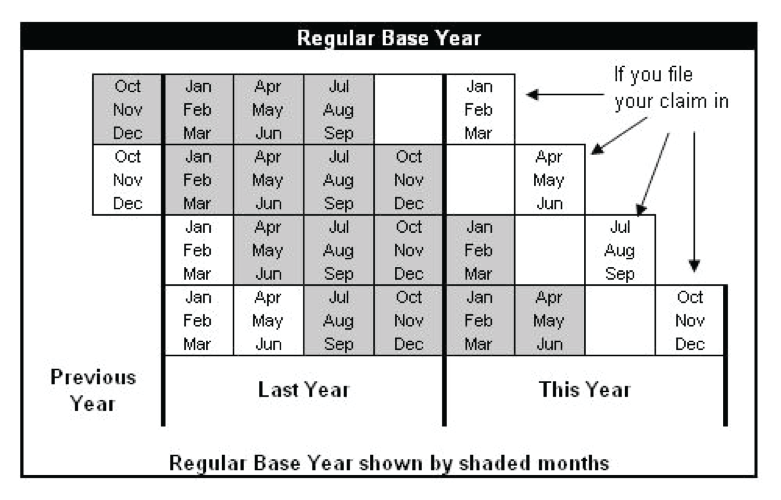 As stated above, if you have not earned enough in your base period to file a claim, you can possibly use your alternate base period or the year prior from your claim date. Earnings you received from your base period will be used to determine your Weekly Benefit Amount and how many weeks you will be able to receive unemployment benefits. The max number you can receive unemployment benefits in Illinois is 26 weeks during one calendar year. This year is sometimes referred to as your “benefit year”. Once you are eligible for benefits, you can choose to receive your payments through direct deposit or check. If you choose the latter, the paycheck will be mailed directly to your place of residence. Estimate your unemployment benefit amounts. Every claimant should file for unemployment benefits as soon as possible after your employment has ended; ideally the first week you are partially or completely unemployed. If you wait longer, you will delay and or potentially lose your benefits. In Illinois, there is a waiting period of one week before you can start receiving benefits. The first week of unemployment is called your initial claim week. To continue collecting benefits in Illinois after you have filed your initial claim, you must continue to file a claim every two weeks, or until you are employed full time. The Emergency Unemployment Compensation (EUC) program and Extended Benefits (EB) program are available in Illinois to help those individuals whose unemployment insurance eligibility are no longer active. During periods of increased unemployment, the EUC program assists individuals to receive additional weekly unemployment benefits. Currently, in some sections of Illinois, nearly 20 percent of the total population are unemployed. Illinois is in the top 15 states with the highest unemployment rates in the United States. If you are still unemployed after already receiving Emergency Unemployment Compensation for 26 weeks, you can apply to extend your benefits. If you qualify for an additional extension, your benefits will automatically begin. It takes about three weeks to receive notification that you qualify for an extension from the EUC. The additional benefits will be equal to your Weekly Benefit Amount and you could receive these additional benefits for up to 20 weeks. To file an extension, the Illinois Department of Employment Security will send you some information once it is requested either online at Teleserve or you can call 1-888-337-7234 to file an extension. You may file online only for first time extensions. Once approved for an extension, it is important to keep actively pursuing employment opportunities and to have evidence of your job searches. A work search form can be found online and will need to be submitted to certify you were indeed looking for work. Guidelines for eligibility for extended benefits are stricter and therefore the information on your work search form is critical and will be checked for accuracy.